to know more. . .
Is this a corporate function? If so, what company? is one year older than The Whopper. 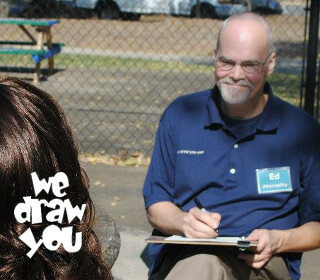 He's been drawing caricatures of people at parties & events for over 20 years. He started at Six Flags Over Georgia, worked there for 5 years, then at the Myrtle Beach Pavilion in 2002 - 2003. 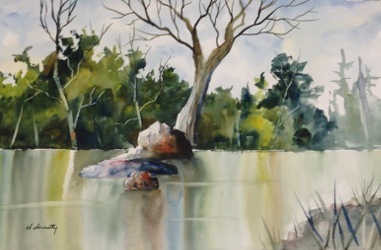 He is also a watercolor painter and teacher. Ed has authored 3 books (with over a million copies not sold) and has published a new book about caricature. For information about our other artists, contact us. Our lead caricaturist, Ed, can draw an average of 12 - 15 faces per hour. Our other artists' times may vary. We aim to be affordable, competitive AND the best value in Alabama. Our rates vary according to your specific event, date & time, attendance, number of caricature artists, etc. Please call or click for a quote. We can provide 1, 2 or more caricaturists for your event, and we'll be happy to guide you to make the decision based on your budget and number of attendees. How many people can you put in one drawing? One person or two in each drawing is typical. We can also draw 3 or 4 in most cases, although more than 4 is not recommended. Is there any guarantee of your service? In our 17 years, we've booked only the most professional, reliable and experienced caricature artists available. We always aim for the best possible results with each and every guest. Our lead artist, Ed has a drawing style that is gentle and lighthearted. Your satisfaction is our top priority - if ever there is an issue please bring it to our attention immediately and we will do whatever we can to make it right! Do you draw bodies and/or activities? Ordinarily not. A most events the numbers of guests require that we draw only faces, in the interest of accommodating as many guests as possible. If you would like additional features in the drawings, ask for a quote on that particular upgrade. The vast majority of our guests are good sports! Occasionally there may be a sleeping child or one who can't stop crying. Parents are usually good about handling this. Some guests don't feel comfortable smiling. Others ask things like "Don't make me fat," or "Don't draw the wrinkles." We do our best to accommodate! What if a guest wants something different? We can do our best to work with him or her, if time permits. Sure we do. Certain weather factors need to be taken into account. Direct sunlight is to be avoided completely. Best results are in shady, quiet, low-traffic spaces. Outdoor events in extreme temperatures (hot or cold) are not recommended. Summer temperatures over about 80 will require a large fan close by. What advice do you have on setting up at indoor events? A quiet, well-lit, low-traffic area works well. For best results, we need to be well away from any boisterous activities, opening doorways with cold air/wind, or loud music/sound systems. Do you draw from photographs? At events, no. We draw only guests who are "live and in person." 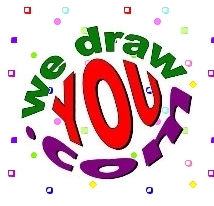 For offsite drawings from photos, use our contact form to request a quote. Yes, I'd like to find out more information. . . Introducing. . . live painting at events. Our artist(s) set up and do one or more complete paintings from beginning to end. Painted live at a fundraiser for The Ritz Theater in Talladega, Alabama. Painted live at a silent auction fundraiser for St. James School in Montgomery. Entertaining has never been easier or more fun (and affordable). Events of all kinds - birthday parties, anniversaries, going away parties, mitzvahs, wedding receptions, company picnics, corporate functions, all these and more provide the perfect opportunity for drawing live caricatures. There's no heavy equipment or time-consuming preparation. All you need are a few chairs, a table and a bit of good lighting. Guests can pose, gather, watch, and each subject gets a tasteful party favor to take home. It's safe and sane entertainment that's mostly quiet except for occasional bursts of laughter. Plus it's a snap to clean up after. It's great for kids, adults or both! Birmingham, Homewood, Mountain Brook, Vestavia, Tuscaloosa, Gardendale, Gadsden, Hoover, Huntsville, Anniston, Montgomery, or anywhere in Central Alabama - contact us now to get more information, availability and rates. You can help create work for Alabama caricature artists! Lighten up, let go and live a little! Impress your guests with good humor and great taste. "Thank you so much for a wonderful job at our daughter's wedding. Everyone loved your work." - Lindia W.
(Forwarded message:) "Benji's party was yesterday and Ed was great!! about him and he is already doing one of their parties next month. I was very pleased!" - Miriam S.
"Hi Ed, I love your work. We are really looking forward to it. Thank you." - Jan B.